Sunday’s Matier & Ross article on candidates for the Coliseum executive director job mentioned an ex-A’s executive remembered fondly by Oakland fans. The exec’s name? Andy Dolich, the A’s marketing guru during the Haas era. That’s great news for A’s fans because few sports business figures can match Dolich’s strengths — decades of successful business and marketing experience, a passion for the Coliseum site and its rich history, and an almost innate feel for what makes Oakland/Bay Area sports fans tick. When we saw the article Monday morning, we reached out to Dolich to see if the report was true. Dolich said in a phone conversation that he believes the Coliseum would be in very capable hands if the job went to Scott McKibben, the other executive director candidate mentioned by Matier & Ross. We agree. But after speaking briefly with Dolich, we couldn’t help but think that he would be the best person for the job. Why? First, Dolich is an established marketing whiz who would join the Coliseum at a time when the venue’s reputation could use a makeover. More important, Dolich’s presence would add a healthy dose of credibility and professionalism to the Coliseum’s daily operations. Business teams are no different from sports teams. The more talent your team has, the better its chances to win. In the Coliseum’s case, the “team’s” players include the JPA, the city, the county, Oakland’s mayor, and the Coliseum executive director, among others. The “talent” in this case refers to those entities’ competence, business acumen, people skills, street smarts, and basic institutional knowledge. Dolich has all of those traits and more. Also, Robert Bobb reportedly will be hired as a consultant for the Coliseum’s new stadium talks. Think of Dolich and Bobb as the sports biz version of the Bash Brothers — two heavy hitters with different personalities but also possessing the skills to help the team win for long stretches. Knowing the history of the 48-year-old Coliseum complex is invaluable. And you won’t find an active sports executive as familiar with the Oakland Coliseum as Dolich, who spent nearly 15 years working there in the A’s front office. As Tony La Russa and Sandy Alderson guided the A’s to winning seasons on the field, Dolich was a key leader for the A’s business success. Dolich used all of his marketing guile to make “BillyBall” — sportswriter Ralph Wiley’s description of early ’80s A’s teams — a household phrase nationwide. Dolich’s marketing work re-established the Green and Gold’s Bay Area media presence and also set the table for the great box-office success achieved when the A’s won the ’89 World Series, as well as four AL West titles and three AL pennants from 1988 to 1992. Those A’s teams not only won games, Dolich’s marketing know-how helped them kick the Giants off the front page of the Sporting Green, and Oakland baseball — for a time — was king of Bay Area sports. If Dolich could help the A’s reach those heights then, he could certainly help the Coliseum now with its fight to keep the A’s and Raiders. Dolich certainly didn’t do it alone in the Haas years, he said repeatedly during our phone conversation. He was but one member of a talented team that included Walter Haas Jr., Roy Eisenhardt, Wally Haas, Carl Finley, Tony La Russa, Dave Duncan, Sandy Alderson, Bill King, Lon Simmons and all those talented players, working toward the same goal. So to be clear, Dolich was a very talented member of a very talented team that accomplished a lot of great things in Oakland. But that’s exactly the point. To keep both franchises, it’s going to take a strong, talented city-county team with a deep bench. If hired, Dolich would join a Coliseum team that already has some talented players — the JPA members and Mayor-elect Libby Schaaf, to name a few. Dolich strongly believes that Oakland can keep both the A’s and the Raiders, and that the Coliseum is the best site for both teams to have their own stadium. We certainly agree that both teams should stay in Oakland. And, with Howard Terminal off the table for now, we would be happy to see the city-county work with the A’s and Raiders owners to keep the teams at the Coliseum site. If the city-county assembles its best, most qualified team, we’re confident that those goals will be reached. Hiring Andy Dolich as the Coliseum’s executive director, in our opinion, would be a great and important next step. We want to publicly thank T. Gary Rogers, Don Knauss, Doug Boxer, Mike Ghielmetti and everyone else at Oakland Waterfront Ballpark for their efforts to keep the A’s in Oakland at the Howard Terminal site. We hope that Oakland Waterfront Ballpark’s recent announcement is a re-boot on their efforts to keep the team, rather than some type of conclusion. Either way, we again thank them for spending time and money on keeping the A’s in Oakland. Lastly, we want to echo their parting thought. Wolff and Fisher should either commit to building in Oakland or sell the team. Anything short of that means they will keep A’s fans in limbo for the next 10 years. And that’s unacceptable, considering that A’s fans have already been going through this nonsense since 1995. 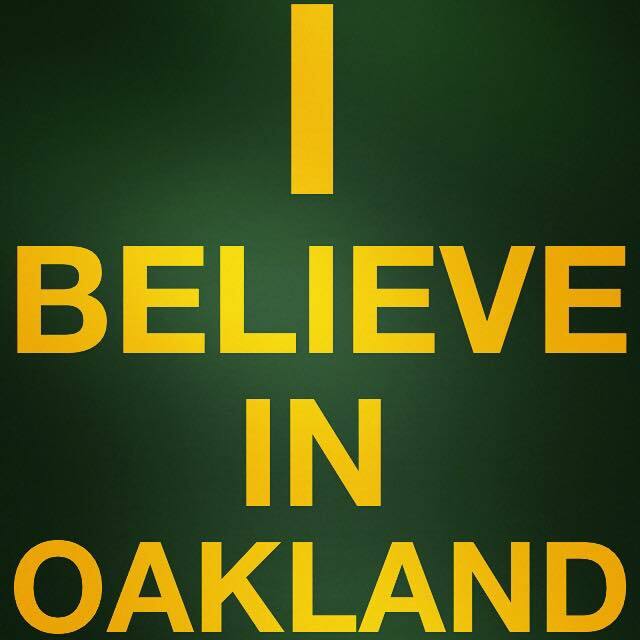 To all Oakland A’s fans who are understandably weary of this fight, please keep the faith and stay united and focused. To Rogers, Knauss and everyone else with Oakland Waterfront Ballpark, thank you again. Please know that your work has been much appreciated, and we have a feeling we’ll be seeing you guys down the road. We have fought to keep the A’s in Oakland for years because we believe in the city of Oakland, which has all of the required economic indicators, fan support and political will to keep all of its sports teams. We believe in Oakland. At the same time, we criticize billionaire A’s owners Lew Wolff and John Fisher because they don’t believe in Oakland, and they really don’t have a good reason why. Wolff and Fisher have never worked sincerely with Oakland and Alameda County officials on building a new stadium and solidifying the team’s future. A decade ago, Wolff’s and Fisher’s negative view of Oakland was merely elitist and inaccurate. Today, their view of Oakland remains elitist and inaccurate and, sadly, becomes more fictional and outdated with each new day. Fact is, Oakland has begun an economic and social renaissance, becoming one of the nation’s hottest real estate markets. Oakland’s current median housing sale price is twice that of Houston’s, for example. Oakland also has added more than 200 new restaurants and many more bars and cafes within the past few years. In Oakland alone, the city’s corporate stable includes thriving big-time companies such as Clorox, Pandora, Dreyer’s Grand Ice Cream and Sungevity. And, next door in Emeryville, corporations like Pixar and Peet’s Coffee also are headquartered. Neighboring East Bay cities offer plenty of potential corporate support, too, with companies like Chevron and Safeway, to name a few among many. We’re not exactly sure why Wolff/Fisher and their apologists continue to knock Oakland and the East Bay, when the reality shows that Oakland is a perfectly viable sports city. One day, maybe they’ll sincerely explain where their wild miscalculations about the city stem from. Until then, A’s baseball fans are held hostage by Wolff’s and Fisher’s misperceptions about Oakland, and by their unhealthy obsession for a South Bay dream that will never come true. So, we fans wait. And wait. And wait. And that’s been damaging to the A’s franchise. Why? Because as Wolff and Fisher have dawdled — while collecting $30 million MLB welfare checks and turning big yearly profits in Oakland — they could have started working with city-county officials on building an A’s stadium in Oakland, within their long-assigned East Bay territory. Who knows how many titles the A’s could have won if Wolff and Fisher had done this? Or if they ever stopped swirling ballpark-related distractions around the franchise each summer? Or if the billionaire owners simply valued winning over money? A few weeks ago, it was the 19th anniversary of when Steve Schott and Ken Hofmann officially replaced the Haas family as A’s owners. All these years later, unfortunately, more questions than answers continue to plague the Athletics’ future. So, we continue to fight for our team and our city. We fight to continue the 46-year marriage between the A’s and the great, underrated city of Oakland. 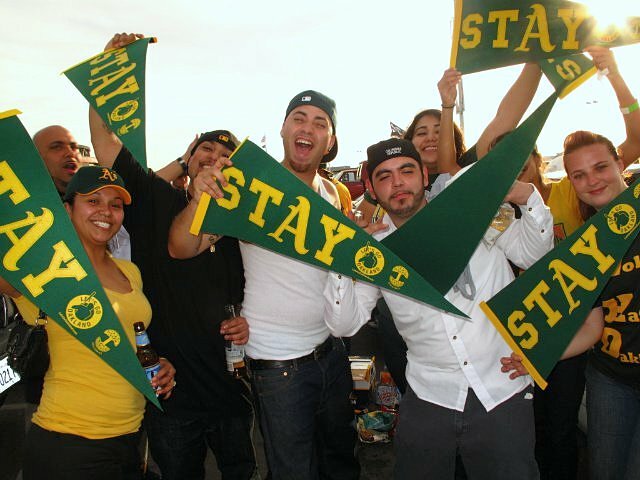 We fight for loyal and passionate Oakland baseball fans everywhere, who deserve better. A’s fans’ loyalty should be rewarded, not met with the shabby treatment that A’s owners have given them since 1995. We fight because many of us remember how the Oakland Raiders badly damaged their own franchise when they moved to L.A. in 1982, and we don’t want the same greedy, error-filled history to repeat itself with the Oakland Athletics. We fight for these and so many other reasons. And we’re not going to rest until the future of the Oakland A’s is made certain with a new ballpark in the great city of Oakland.